Gordon Clem Academy Aremiet Mixed Secondary School is a public high school built to serve the students in the greater Aremiet area of Isiolo County, Kenya, Africa. Originally started as a girls’ rescue center for girls fleeing Female Genital Mutilation (FGM) and Early Forced Marriage (EFM), the community of Areimet, gave 10 acres of land. Several organizations got together and a building was built for rescue but those involved in the joint effort could not keep their original commitment and the rescue center never got off the ground. Gordon Clem, who was on the faculty of the Choir School of St. Thomas Church of New York for 40 years and was Headmaster for 28 years, was attracted to helping disadvantaged people and always wanted to spend time in Kenya as a missionary. The vestry at Trinity Church in Lenox, MA and friends and associates of Gordon Clem decided to raise funds to go with a bequest of Gordon’s will in order to build Gordon Clem Academy in his honor. Working through Expanding Opportunities, the funds have been used to build a school and establish a connection with the Areiment community. 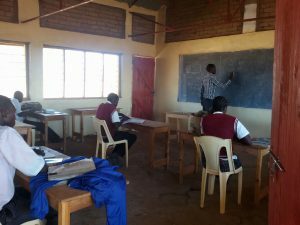 The community of Areimet and the Minister of Education in Kenya have taken the project upon themselves to turn Gordon Clem Academy into a public community school. It has been renamed as Gordon Clem Academy Aremiet Mixed Secondary School. Currently, work and meetings are in progress to development agreements between all parties involved. The rescue center is there and the hope is to use it for birth, rescue, and dormitory for girls fleeing FGM and EFM. These girls would attend Gordon Clem Academy Aremiet Mixed Secondary School for the educational portion of the plans. Your support will allow this work to continue and for a remote Kenyan community to have access to public education and for their children to have hope for a future. Won’t you donate today? Your donation is set to occur monthly until you cancel. If you wish to make a one-time donation, please uncheck the "Make this Donation monthly" box. Please send a separate email if you wish to designate your funds to a specific purpose or project. Thank you for supporting the work of Expanding Opportunities. Follow Gordon Clem Academy Ariemet Mixed Secondary School on Facebook.